It has been about a year since my work bestie informed me that there was a Swedish bakery within walking distance of the office. 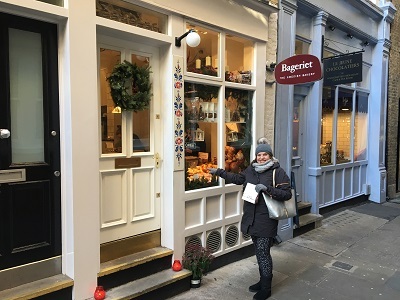 We tend to talk about Scandinavian things (Scandipop, what things mean in Norwegian, all things Danish etc) significantly more often than most people in London would do so it made sense that I would find about this bakery from her. The place itself is cosy (in the good sense of the word) with a lot of different baked goods all around to make you salivate. Good thing I had a mission otherwise I would have walked out with more than I intended. 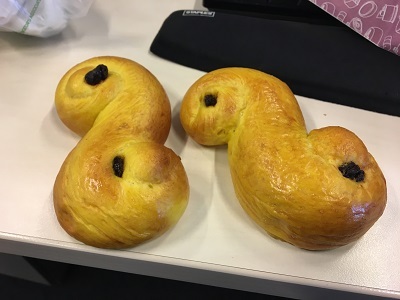 Lussekatter (or saffron buns as we would call them in England) are traditionally eaten in Sweden in Advent season, especially on St Lucia’s Day on December 13th (a date that used to coincide with the Winter Solstice before we moved to the Gregorian calendar). The name ‘lussekatter’ actually means ‘St Lucia’s Cats’ and this comes from a rather strange history involving children being taken by the saint over Christmas and cats being curled up. If you want to know more about St Lucia’s Day and the associated pastry there is a cool written history here. Anyway, to the pastries themselves. The big thing of note is how yellow they are. Traditionally this yellow is from copious amounts of saffron, but due to the expense of saffron it is usually supplemented with some yellow food colouring. The dough is an enriched one which is sweet and warming thanks to a blend of sugar and Christmas spices. It’s got the richness of a challah, but it’s slightly dryer and harder making it very suitable for dunking in a hot drink. Made me want a mug of hot chocolate to dunk it in because I think that would have completed the experience.